What kit will I need to join the drum corps? What kit do I need to become a Drummer? 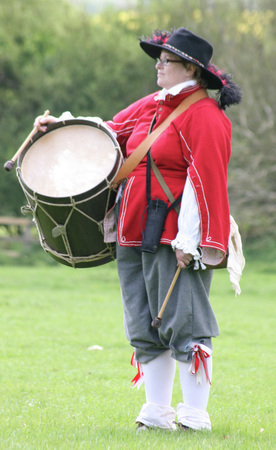 Knowing what kit you will need to buy to become a drummer is tricky for new members of any regiment, so here in Hammond's we have taken time to agree a dress code for everyone in the regiment. We have a democratic approach to getting the presentation of the Regiment right. We have so many members with so much experience, we held meetings with all divisions within the regiment - pike, musket, artillery, drums and colours, and camp followers, and agreed between ourselves that there should be a Dress Code for all divisions, separated into three layers of equipment - Basic Kit, First Choice Kit and Finishing Touches. We also have two levels of dress - Parade Order and Battle Order. Parade Order applies in Living History and Parade scenarios, whereas Battle Order is a slightly stripped out version for Sealed Knot musters. This lists the basic kit that we ask our members to get as soon as possible. We start with shoes or boots depending on your role, on the basis that this is the first big expense you will have to face. The other items of kit on this list can be borrowed or bought relatively simply. This lists the equipment you might choose to move onto once you have the basics. All of these items are optional, but will massively improve your appearance in Parade and Battle Order. Additional items of equipment allow you to start to develop a story about what sort of character you are portraying in the seventeenth century, and will allow you to interact with members of the public with confidence. This list is left greatly to the more experienced member, who is developing a back story, which will allow them to engage with the public to some level of depth and knowledge. Back to I want to be a Drummer!